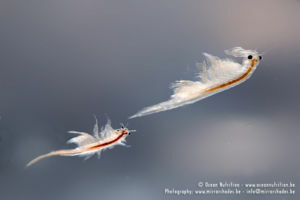 Brine shrimp (Artemia salina) are a type of aquatic crustacean. They are found worldwide in salty water, though not in oceans. Artemia is a well known genus as one variety, the Artemia nyos, a hybrid of Artemia salina, are sold as novelty gifts, most commonly under the marketing name Sea-Monkeys. In the aquarium hobby they are an important source of food, if not the most important live food for all sorts of aquatic animals, including fish and frogs. You can buy live Artemia from your local pet shop in small bags which you sieve and feed to your aquatic pets. You can also buy frozen cubes or thin "sheets" of Artemia from pet shops, and break off a cube or a chunk and drop into the tank. Baby brine shrimp is the name given to newly hatched brine shrimp. 2 litre or larger V shape container. A drinks bottle is ideal. Sea salt (ordinary table salt is not suitable). Clean tap or bottled water with no chlorine or chloramine in it. Cysts. 0.5 tsp per 2 litres. Small bright lamp. 40W bulb directly over the container. Air pump with hose and a air-stone. Bicarbonate of soda. The water needs to have a KH of at least 10d. You first need to obtain their eggs (which are called cysts). These are available from online web sites or your local pet shop. You then need to prepare a water container of around 2 litres and fill it with clean water. Add 1 tsp of Bicarbonate of soda to ensure the ph of the water is 7.5-8.5 and a KH of around 10d. Heat the water to around 18-28°C (64.4-82.4°F) . The eggs will hatch faster at 25-28°C (77-82.4°F) . Add to the water the salt, about 20g (1.5 tbsp) per litre of water. Stir until the salt is totally dissolved. Place the lamp over the container as the Artemia require a bright light source for the first 4 hours in order to hatch. Add the air-stone and pump so that the air-stone is at the bottom of the container. The water requires strong aeration throughout the process. After 15–20 hours at 25°C (77°F) , the eggs will hatch. 20 hours after adding the eggs, you switch off the air pump, wait 10 minutes to let the empty egg cases float to the surface (you don't want these) and you can collect the Artemia to feed to your aquarium. The Artemia are attracted to light sources so a small torch (flashlight) may be used to concentrate the nauplii as you siphon off the animals. Alternatively you can feed the nauplii in order to increase their size and protein value. Artemia can be fed dried yeast or dried microalgae such as spirulina to enhance their nutritional value, or use whey, wheat flour, etc. Just sprinkle the powder on the water and don't over feed. If the water is very cloudy then don't feed. Reduce the light source to a low level as the Artemia will not then burn up their energy trying to swim towards the light. Don't feed earlier than 24 hours after you added the eggs to the water as the nauplii will not have the ability to eat before then. 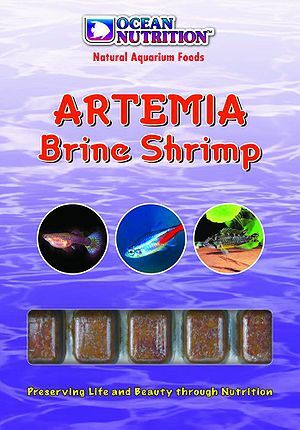 You can buy special 'enrichment foods' for Artemia which significantly boost their nutritional value as food. But this causes the Artemia to die within 36 hours so you need to add this food, wait 6–8 hours and then feed them to your aquarium. Many commercial fish food companies sell brine shrimp in various forms. The nutritional value of this food greatly depends on what is fed to the Artemia before harvesting and how large the Artemia are allowed to grow. These preparations tend to remove some of the nutritional value however. So manufacturers tend to add extra vitamins to make their products more appealing. Comparing their analyses before buying is advised. This is usually a freeze-dried process which extracts the moisture. Protein - 47% min., Fat - 5.5% max., Fibre - 0.5%, Moisture - 6.0% max., Ash - 0.1% max. Artemia franciscana : Protein - 39.4% min, Fat 4.96% min, Fibre - 5.0% max, Moisture - 9.6% max, Ash - 28.1% max. 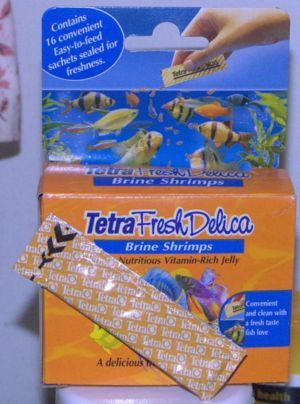 Tetra do a range of jellied fish food called TetraFreshDelica. Molluscs and crustaceans (Artemia 39%), vegetable protein extracts, derivatives of vegetable origin, fish and fish derivatives, oil and fats, colourant. Protein 5.0%, Oil 1.0%, Fibre 1.0%, Ash 2.0%, Moisture 90%. Added vitamins per kg: Vitamin A 10 200IU, Vitamin D3 637IU, Vitamin E 35 mg, L-ascorbyl-2-poly-phosphate 168 mg. This is as close to keeping live brine shrimp cultures as you can get. Adult brine shrimp are quickly frozen and can be kept in the freezer for 3–6 months. The nutritional properties of brine shrimp are determined by the food they are given before they are harvested. Brine Shrimp (Artemia sp. ), water, Vitamins: Ascorbic acid, beta carotene, biotin, hydroxocobalamin (source of vitamin B12), niacin, riboflavin, thiamine. HCL. Amino Acids: methionine (dl-methionine), L-Lysine, taurine. Trace elements of calcium chloride, potassium iodide, ferrous sulfate, manganese sulfate, magnesium carbonate, zinc sulfate. A low-res video of two brine shrimp and one showing them mating. This page was last edited on 27 September 2011, at 11:11.